Doctor Who: Looking back at CASTROVALVA | Warped Factor - Words in the Key of Geek. 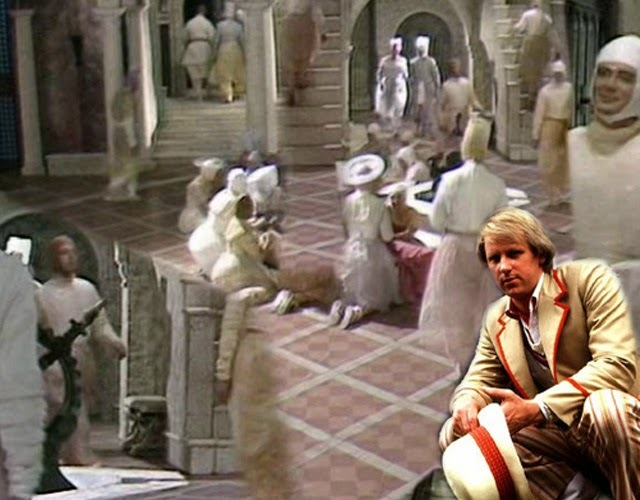 In every sense, the beginning of Peter Davison's time as the Doctor was the end of an era. Tom Baker had taken his last trip in the TARDIS, and instead of a Saturday teatime helping of Doctor Who, Season 19 was shunted onto weekday evenings, usually Monday & Tuesday. Sacrilege, surely? But then as a great man, and indeed Peter Davison's own favourite Doctor once said in the immediate aftermath of his own regeneration, "Life depends on change, and renewal." It was perhaps fitting then that Castrovalva was something of a departure. Or was it? 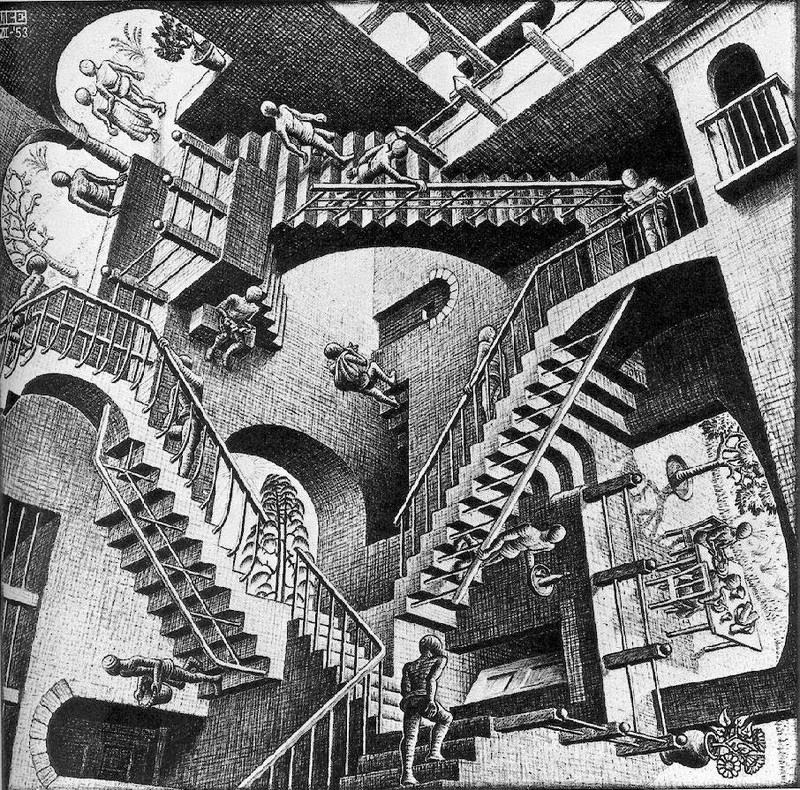 For a delve into the art of MC Escher reveals much of the inspiration behind the topsy-turvy city of Castrovalva itself. 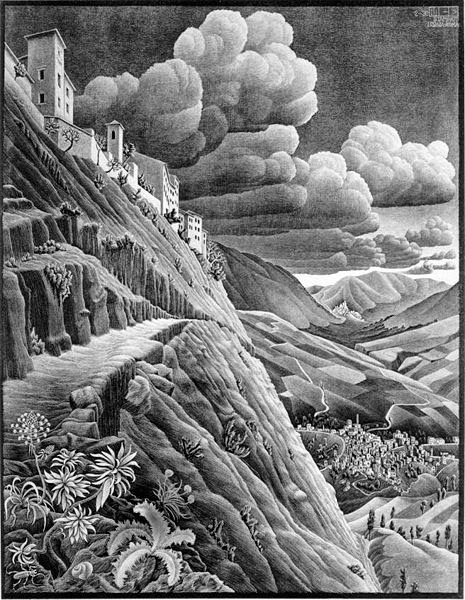 The Dutch artist, full name Maurits Cornelius Escher, made the lithograph print from which the Fifth Doctor's first story takes its name in 1930 after visiting a village in Abruzzo, Italy which goes by the exact same moniker! "Recursion is a fairly simple concept. Something that recurs references itself. The reflection in a mirror of a mirror is recursive: the reflected mirror is reflecting its own image and doing so indefinitely." Elements of selected examples of his other work also make themselves known in the grand scheme of things. Take a look at Ascending And Descending, Belvedere & Relativity & you'll have a pretty solid grounding! Little wonder that its almost too perfect a trap for an addled mind. "Perhaps I should ask, what would I do if I were me?" TEGAN: No, that looks like the end of the trail. NYSSA: This part of the TARDIS can't have been used for centuries. TEGAN: It does go on and on. TEGAN: Yes, I get that feeling too, that we're going downwards. The one man who can navigate the maze still needs a little time to get used to the fact he's now a younger-looking fellow with a developing fondness for cricket! TEGAN: Will you have to stay here long? DOCTOR: Oh, just until my dendrites heal. The nervous system's a very delicate network of logic junctions. DOCTOR: Oh, yes, I was forgetting, Nyssa, bioelectronics is your strong point. Yes, well, my tussle with the Master came at precisely the wrong moment. When the synapses are weak they're like radio receivers, picking up all sorts of jumbled signals. TEGAN: I get it. The Zero Room cuts out all interference. DOCTOR: Completely! Even the gravity's only local. Goodness me, I'm tired. NYSSA: But there isn't even a bed. DOCTOR: Bed? Oh, I don't need a bed. Not in the Zero Room. Some semblance of the computerised logic of Logopolis remains, too. Just to complicate what's rapidly turning into quite a puzzle. Remember the process of Block Transfer Computation? ADRIC: How much more of this is there? DOCTOR: It has to be measured in every dimension. ADRIC: But it can't have thirty seven dimensions! You said it was an ordinary Earth object. DOCTOR: In every dimension. I need every detail. The Logopolitans convert that into a precise mathematical model. DOCTOR: Well, to overlay it on the TARDIS. 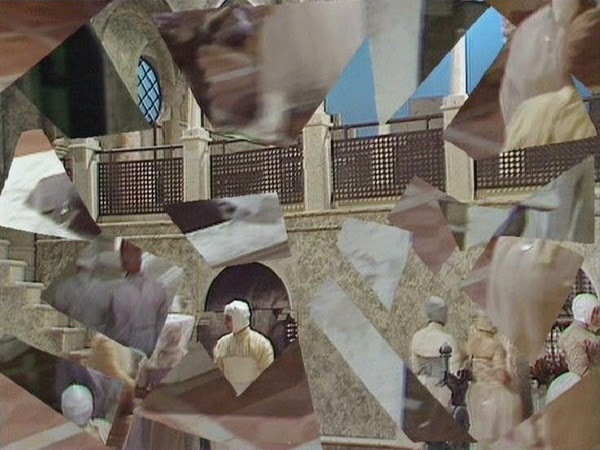 ADRIC: And that's Block Transfer Computation? DOCTOR: Well, it's a way of modelling space-time events through pure calculation. DOCTOR: No, transcendentally. It's quite hard to explain in a word. ADRIC: Creating solid objects through pure mathematics. 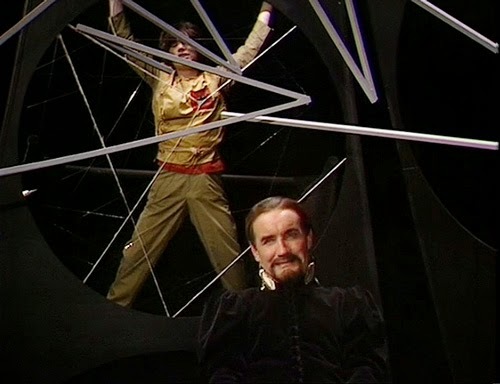 The Master is able to kidnap Adric and force him to assist in the calculations necessary for his most ambitious plan yet. Using these he creates Castrovalva, hiding within it in plain sight under the guise/alias of the Portreeve! "Well, Adric, this is my proposition. Life will immediately become more comfortable for you if you join forces with me. Or do you prefer to remain in the web throughout eternity. A mere utility. You may speak...."
A complicated game, then. But Tegan might just be on to something. ''That wretched square again''. The recurring feature makes it look to her ''as if space had folded in on itself.''. In a sense it has! ''Recursive occlusion. Someone's manipulating Castrovalva. We're caught in a space-time trap!''. Right you are, sir. PORTREEVE: The Doctor has journeyed dangerously to honour us here in Castrovalva, and look at the outcome. MERGRAVE: Portreeve, should we not begin? PORTREEVE: Everything's in hand. With this tapestry and with patience, there's nothing one cannot achieve. Nothing, Doctor, in this world or in any other. The tapestry has the power to build and hold in space whole worlds of matter. But I've contented myself with one small, simple town. For the final meeting of the Doctor with his Master! But having until now done an admittedly impressive job as puppet-master he makes an equally brilliant job of being discovered & escaping to fight another day! DOCTOR: So that's how you're sustaining Castrovalva. MASTER: My own adaptation of the block transfer computation. Since we last me, Adric's mathematical powers have been put to lively use. MASTER: That, too. You were wise to deter your young friends from approaching. The hadron power lines are lethal to the touch. DOCTOR: All right, Master. It's me you want. Let the boy go. MASTER: Yes, a trap has now been sprung. We can begin to dispose of all the bait. 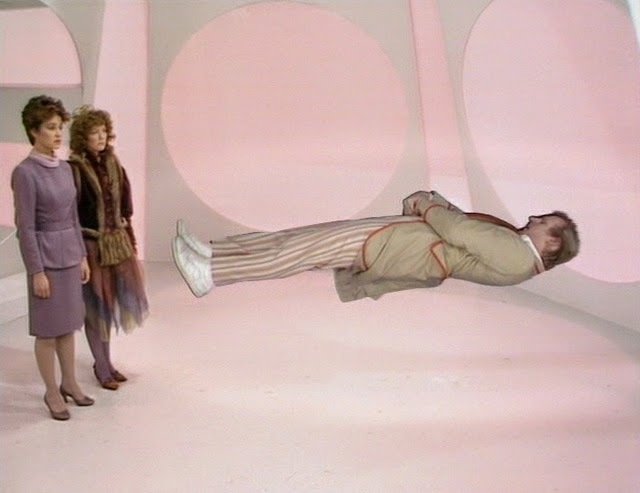 Of course he fouls up the whole plan, but the Master will return in Time-Flight to throw up quite a surprise for the new Doctor and his chums. (By then though the Doctor will be altogether more stable in his new body & personality, having had a while to get used to them.) And so a three-year stint as captain of the TARDIS- now containing a cricket clubroom- began in earnest!